In Photoshop, a clipping path is a vector graphic that outlines an object, like a trace around its edges. Clipping paths are usually used for one of two purposes: cutting an object out or wrapping text around it. In product photography, the most common use of a clipping path is to remove the background from a product image. The clipping path goes around the product, which can then be placed on another background or saved as a transparent image. Clipping product images is also known as “etching,” “cut-outs,” or creating a “silo” (short for “silhouette”). After a product is cut out from its background by a clipping path service, it can be placed on a new background or saved as a transparent product image with no background. Why outsource to a clipping path service? Creating clipping paths or layer masks (there are strong opinions about the superiority of layer masks vs clipping paths) in order to perform image cut outs is a time-consuming job that involves a lot of zooming and clicking in Photoshop or Illustrator. It’s repetitive, boring work that can turn e-commerce retouching into a bottleneck—but it’s necessary. Fortunately, because product images are digital, clipping is ripe for outsourcing. The best clipping path services will save you time and money by allowing you to focus on more creative, revenue generating work. The worst photo clipping services are going to cost you more than just money; they’ll blow deadlines and cause endless headaches, too. How much does a product photo clipping path service cost? Don’t just look at per image pricing when choosing a Photoshop clipping path service provider. Look at the TCO, the Total Cost of Operation. A race to the bottom in terms of per image pricing will usually end up costing you more in the long run. If your purpose is to save time and get your product listings up faster in order to sell more, you need to think about onboarding, management, turnaround time, scale, and quality. There’s a lot of empty promises out there when it comes to clipping path outsourcing. If a no-name company with a homemade WordPress site is promising you 1¢ per image, they’re not going to deliver. It will be a spectacular failure that will eat working hours and cause you to chuckle darkly the next time someone pushes cut-rate outsourcing. Before trusting your clipping to an outsourcer, you need answers to the following questions. How am I giving instructions? When and how will I get my images back? What methods of communication are available? Can the service scale with my needs? If the clipping path service can’t provide you satisfactory answers to the above questions, you shouldn’t outsource to them. Clipping path services for footwear should offer hand drawn clipping paths. What do the best picture clipping path services do? Let’s take our Photoshop clipping path service provider checklist one at a time. 1. How am I giving instructions? Really this can be rephrased as “Is there an online system for communication?” If you’re reliant on emails, PDFs, or even version control cloud services like Google Docs, you’re in trouble. While it might seem obvious to you what needs to be done, if you leave room for error then error will appear. For example, if an image contains a product, a model, and their combined shadow, you need to define which (or all) of the three should be outlined by the clipping path. And you need the flexibility for that to change per order and per image, without requiring an extensive back and forth with a time-shifted account rep.
Additionally, odds are you want more than just the background removed from your product image. Even if you’re not looking to outsource retouching, it’s worth getting other basic image editing while your product is getting cut out. An online system that allows you to create specifications defining whether a clipping path is generated automatically or by hand, set image size and aspect ratio, margins, cropping, file format, shadows, etc. will prevent your orders from turning into a chaotic time sink. The best clipping path services will have their own proprietary interface that allow specific and detailed instructions at a per order and per image level. Give product image editing instructions at the per image or per order level with Pixelz clipping path service. This can be a “what’s right for you” situation. There’s quite a lot of software available and in use by clipping path services to automate the process. An automatic clipping path will save a lot of time, which in turn reduces price, but it does come at a cost. Many solutions are much like the Magic Wand tool in Photoshop: it’s quick, but works best with high contrast images and can get inaccurate near edges. And when it goes bad, it can be REALLY bad. A hand-drawn clipping path will take longer but be much more accurate. The best clipping paths are still made by actual humans zooming in and using the Photoshop Pen tool to draw lines around your product. You know your product and your product photography setup. If you’re shooting a black product against a white background without shadow, maybe the savings from an automated clipping path are worth it to you. The best clipping path services will give you the ability to choose between automatic paths and hand-drawn paths at a per-image level, so you can manage cost and quality. 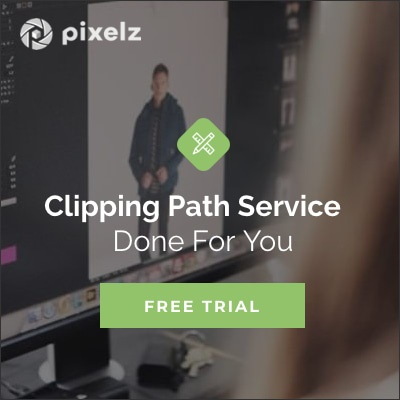 Specify hand-drawn clipping path versus automatic clipping path within a Pixelz account. 3. When and how will I get my images back? “Time is money” is as true in e-commerce and clipping path services as everywhere else. The best clipping path services will deliver silhouettes in 24 hours or less. Our own Pixelz Professional guarantees Next Morning delivery and orders can be expedited in 3 hours or less at the click of a button. Etched images should be made available to you in a variety of ways, so that you’re not bound to any one method: for example, by web, FTP, and API. In all cases organization should be clear, simple, and built to scale. If a prospective clipping path company says they’re going to dump all images into a single FTP folder, without subfolders or separation of orders… Run away! Don’t walk, run! One click returns images with clipping path in 3 hours or less. 4. Is there quality assurance? Can you review and reject images before download? Ideally, there’s an online interface that allows you to review before and after images and provide commentary on reasons for rejection. Review can be tricky for clipping paths outside of Photoshop, but there should at least be a method for providing notes like “missed fringe at bottom of bag” in a quick manner that associates the comment with your image. Is there a simple tracking system for rejected images? Organization saves you time. You don’t want to be searching for file names and emailing repeatedly to ensure an order is complete. A close zoom is essential while hand drawing clipping paths. 5. What methods of communication are available? Communication is a major headache when it comes to outsourcing, and clipping path services are not immune. Of course reputable services should offer support by email, chat, and phone, but there’s more to it than that. When comparing services, look not just at promised availability but also at methods that exist that will cut down on the need to communicate. For example, how intuitive and powerful is the online interface? You won’t need to email if there’s already a system in place for handling your needs. 6. Who are they already working with and what’s their reputation? Photography is a big and varied business, and some clipping path services try to cater to all segments of it. But the needs of an e-commerce photo studio are quite different from those of a wedding photographer, lifestyle photographer, or portrait photographer. Look for a specialist. Check their client list (Pixelz customers). Are they working with brands you know and respect? Do they have customers happy enough to be giving testimonials or participating in case studies? Look for independent ratings services, like TrustPilot. Even if the Internet tends toward angry diatribes, it should at least give you an idea as to whether the photoshop clipping path service has been around for a while and is responsive. 7. Can the service scale with my needs? Product photography and retouching has seasonal peaks and valleys. When selecting a Photoshop clipping path service provider, you should be sure that you’re not outsourcing your bottlenecks along with your background removal. The best clipping path services should have the same workflow and turnaround time for you whether you’re uploading 100, 1000, or 10,000 images a day. To be sure this is true, look at the systems in place—is post-production efficient and scalable? (At Pixelz, we’ve built a Photoshop assembly line.) See how well the interface you’ll be using performs, how simple it is to use, how well organized your orders are, and how much information it gives you about the whole process. Find out how image editors are assigned to create your clipping path, how training works, and how secure your images are. Does the clipping path service currently handle a high volume of images? The best indicator for the future is the past. If a company is already clipping a hundred times your volume, then they won’t have to scramble to handle large batches. Is the system flexible enough to adapt to your workflow? The best clipping path services will deliver images where you need them to be, with folders, filenames, and metadata as you desire. You shouldn’t be performing any manual work after delivery. You might also want to think about additional retouching. Even if you’re only looking at photo clipping services right now, think long-term when you’re outsourcing. Etching, clipping, cut-outs, whatever you want to call it, is a relatively simple task—skin retouching, reducing apparel garment creases, and recreating areas obscured by props are not. If you’re already adapting your workflow to use an outsourced clipping path service, choose one that you can grow with. Choose a clipping path service that offers more sophisticated retouching so you can grow together. Pixelz has edited over 15 million images for leading brands, retailers, and photo studios around the world. We got our start as “Remove the Background” many years ago, meaning our heritage is that of a Photoshop clipping path service company. We provide all levels of retouching for e-commerce, from DIY entrepreneurs to Fortune 500 brands and retailers. Our digital assembly line is taking e-commerce retouching to a level of speed, consistency, and value never seen before. A few clicks allow you to choose multiple clipping paths, automatic or hand-drawn, with natural shadow or without. We handle millions of images, meaning you’re highly unlikely to stress us with image volume no matter how crazy your photoshoot seems to you. And when you’re ready to scale your product image retouching operations, we’ve got the most advanced retouching options around. If you’re looking for the best clipping path service, we think you’ve come to the right place. Try it free today.